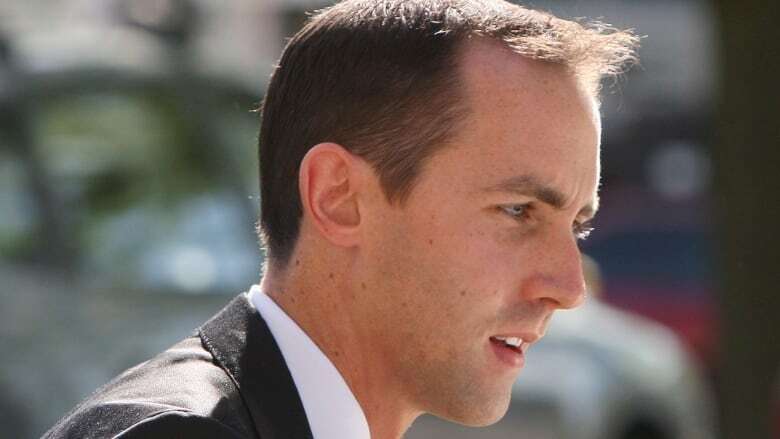 Last week's trial of Michael Sona, the Conservative campaign worker charged with releasing a misleading robocall in the 2011 federal election, revealed the various pranks and tricks used during elections. Last week's trial of Michael Sona, who is charged with releasing a misleading robocall in Guelph, Ont., in 2011 to keep some voters from casting ballots, featured Conservative Party workers testifying about the pranks and tricks used during elections. The tactics are used by all parties. Some of it is considered standard and expected. Other times it verges on nasty sabotage. But just as notable was the attitude toward them by some campaign workers. While most Canadians would probably be surprised to hear about the tactics, most people who have worked in politics treat them as much more routine. Witnesses at Sona's trial in Guelph, Ont., last week were probed by both the Crown and defence lawyers about the tactics employed by their campaign and the opposing Liberal campaign. Here are five tactics that came up at the trial, as well as some of the witnesses' reactions to them. A phone bomb means keeping the competition's phone ringing as much as possible on election day, making it harder for supporters and volunteers to get through to their office. Sona's lawyer, Norm Boxall, gave one witness the example of posting an online ad for free kittens along with the other candidate's campaign office phone number. A related phone trick: continually faxing blank pages to their office. John White, who was in charge of get-out-the-vote efforts for the Conservative campaign in Guelph, said there was "certainly a lot of phone mischief" during the lead-up to the 2011 election, which included a phone bomb that hit the Conservatives' office. "Basically the phones just ring," he said. When campaigns know they won't do well in a certain section of the riding, they might send volunteers to make sure Elections Canada officials are properly applying the rules that require voters to show ID — that is, they challenge people on their ID. "I might want to send someone who's particularly gung-ho to a non-supportive poll," White said in his testimony. "Scrutineers are the cornerstone of vote legitimacy," White added in an email to CBC News. "One of the jobs of a scrutineer is to ensure that a voter is legitimate, and that proper ID is being shown," he said, adding that he carefully trained partisan scrutineers in what is and isn't acceptable identification. "If I can tell that a volunteer is particularly enthusiastic about ID inspection, it is in my strategic interest to put them in a poll that might not be as favourable.​"
Some campaigns will use live callers or robocalls to distinguish between their position and their opponents'. Like contrast or negative ads, the calls could be seen as an attack on the person who is the subject of them. 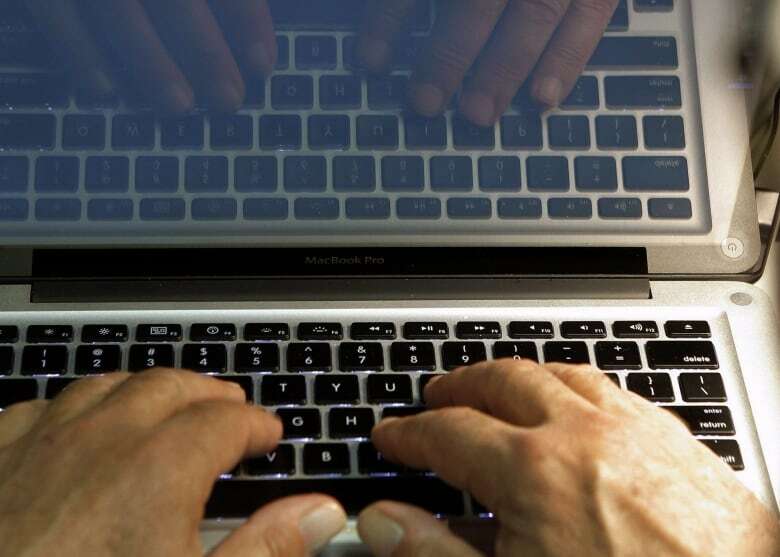 Automated robocalls can be made by uploading phone lists and audio recordings to a website. (Damian Dovarganes/Associated Press)In Guelph in 2011, the Conservative campaign was "livid," according to one witness, after the Liberal campaign sent out a robocall that said Conservative candidate Marty Burke was anti-abortion. The recording featured a woman who used a fake name and didn't say she was calling from Liberal Frank Valeriote's campaign. "The race in Guelph is very close," the woman said in the message. "Vote strategically on Monday to protect our hard-earned rights from the Conservatives and Marty’s extreme views." In that case, the call broke CRTC rules for automated calls, and the Guelph Liberal riding association was fined $4,900. The rules require that calls identify on whose behalf a call is made, provide call-back information and display the originating telephone number or an alternate number where the originator can be reached. Valeriote said the campaign didn't know about some of the rules and apologized in 2012 for breaking them. But he said in an interview with CBC News that, other than adding the proper taglines, he wouldn't "have done anything differently." White says the Conservative campaign lost some volunteers after the Liberals' call went out. Some of the other pranks that happen during election campaigns include putting gum in the locks of an opponent's campaign office doors, stealing signs and slashing tires. In the 2011 federal race, at least two campaigns rented chicken costumes for a volunteer to wear to taunt an opponent (one campaign claimed the rental for a refund through Elections Canada). Other candidates hired private security to guard their campaign offices the night before voting day. 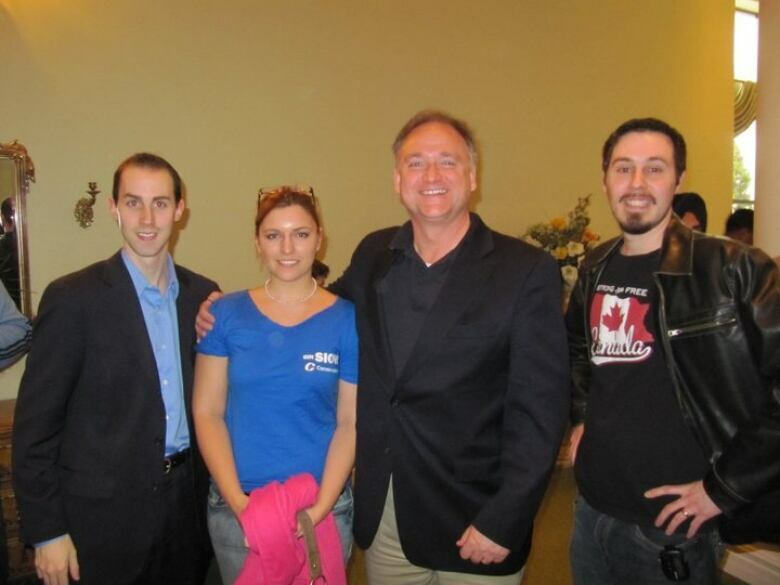 Former Guelph Conservative campaign worker Michael Sona, left, poses with an unknown woman, Guelph Conservative candidate Marty Burke, second from right, and deputy campaign manager Andrew Prescott, right. (Facebook)The misleading robocalls that are the subject of the allegations against Sona have become well-known since May 2, 2011, the date of the last federal election. But the reaction from some of Sona's colleagues suggests they weren't as shocking to political enthusiasts as they were to those without campaign experience. Mitchell Messom, who was a friend of Sona's and a former Conservative Party intern, told the court that Sona bragged to him about launching the robocall to misdirect voters and about covering his tracks. Crown prosecutor Croft Michaelson asked Messom what his reaction had been. "You probably should shut the f--k up about this. You probably shouldn’t be telling everybody," Messom recalled telling Sona. Sona says he had nothing to do with the misleading calls. Another witness described campaign manager Ken Morgan realizing some of the Conservatives' supporters were getting misleading calls on election day that told them their polling station had moved, as well as a call that said the polls were closing early. According to Prescott, it was only after the Conservatives' supporters started getting misleading calls that Morgan had Prescott end them.